Trump claimed that economic growth has “never” been below zero until last quarter’s drop, which is far from true. It has been below zero 42 times since 1946. He said “there are no jobs” to be had. In fact, there were 5.4 million job openings recorded at the end of April, the most in 15 years. He said the “real” unemployment rate is “anywhere from 18 to 20 percent” and “maybe even 21 percent.” We see no factual basis for this opinion. He boasted he would have blocked new Ford plants in Mexico by threatening to impose a 35 percent tax on vehicles and parts made in Mexico and shipped to the U.S. But only Congress can impose taxes and such a tax would violate the North American Free Trade Agreement. Trump claimed the five Taliban leaders exchanged for Sgt. Bowe Bergdahl “are now back on the battlefield trying to kill us.” But all five remain in Qatar, where they continue to be monitored and are subject to a travel ban, according to the State Department. He also made the misleading claim that health care premium costs are going “up 29, 39, 49 and even 55 percent.” He’s talking about some proposed rate increases on the individual market that still need regulatory approval. There are also proposed rate decreases or single-digit increases that did not have to be submitted for review. Trump, who gave his speech in the lobby of Trump Tower in New York City, becomes the 12th Republican to officially join the race. The billionaire developer promised strong leadership and savvy economic stewardship. But he went too far in talking down the present state of the economy. GDP: Trump said, “Last quarter, it was just announced, our gross domestic product – a sign of strength, right? But not for us. It was below zero. Who ever heard of this? It’s never below zero.” That’s pure nonsense. Actually, the quarterly change in real GDP has been below zero 42 times since 1946, including a drop exactly one year before the most recent one. Trump was referring to the 0.7 percent drop in the annualized rate of real (inflation-adjusted) GDP growth that Commerce Department statisticians reported on May 29. The drop came as no surprise, given the record snowfall that paralyzed Boston and much of the Northeast in February, and the near-record snow that covered the Chicago area and much of the Midwest. There had been an even bigger, 2.1 percent drop in the January-March quarter of 2014, also attributed partly to bad weather. Currently, all indications are that growth has resumed at a modest pace. The Federal Reserve Bank of Atlanta estimated on June 16 that real GDP is increasing this quarter at an annual rate of 1.9 percent, while the “Blue Chip” consensus of private economists falls in the 2 percent to 4 percent range. Opinions can differ on whether the current growth rate represents “strength” or not. And we’re not sure how seriously Trump meant his “never” comment to be taken, even though he repeated it for emphasis. In any case, it’s not true. Actually, the Bureau of Labor Statistics reported on June 9 that the number of job openings at the end of April had increased to 5.4 million, the most job openings since the bureau began tracking them in December 2000. The previous record came in January 2001. The new record is 1.1 million higher than the number of job openings recorded in November 2007, the month before the Great Recession of 2007-2009 began. 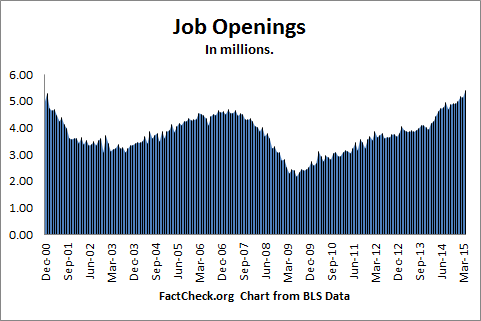 And the number of openings has more than doubled — increasing by 3.2 million — since hitting the low point in July 2009. We see no factual basis for this claim. Trump is going well beyond the exaggeration that Mitt Romney made during the 2012 campaign that the “real” unemployment rate was 15 percent. And back then, the official rate was 8.3 percent, compared with the current rate — which is actually 5.5 percent, not the 5.6 percent Trump cited. Currently, that U-6 rate stands at 10.8 percent, well below where it was in 2012, though still not down to the 8.4 percent rate of November 2007, the month before the Great Recession of 2007-2009 began. So where does Trump get his 18 percent to 21 percent range? The highest number we found from any economist comes from Peter Morici, an economist at the University of Maryland, who has argued that the “real” rate is “at least 18 percent.” In addition to categories included in the U-6 measure, Morici counts what he calls “the effects of immigration.” And he also adds in the “many” students who are being “duped” into applying for “useless programs” at universities and for-profit schools. In April, American automaker Ford announced that it was putting $2.5 billion into building new engine and transmission plants in Mexico. The company said that it expects the deal will bring 3,800 new direct jobs to that country. But Trump believes this is bad for the U.S., and said that as president, he would impose a huge tax on Ford vehicles and parts manufactured in Mexico and shipped to the U.S.
“Every car and every truck and every part manufactured in this plant that comes across the border, we’re going to charge you a 35 percent tax, and that tax is going to be paid simultaneously with the transaction, and that’s it,” he said. But only Congress, not the president, can impose taxes. And Trump’s tax proposal would likely run afoul of current international trade agreements. “Mr. Trump’s tax would violate the current North American Free Trade Agreement, NAFTA, for most cars and car parts sourced from Mexico,” wrote Sean McAlinden, chief economist and executive vice president of research for the Center for Automotive Research, in an email to us. McAlinden said that under NAFTA, new vehicles and parts containing 60 percent North American manufacturing content are allowed tariff free access to all three countries. But McAlinden noted that Congress could possibly vote to revoke NAFTA and vote to withdraw from the WTO. And as president, Trump could sign that legislation into law. Even so, Trump’s proposal to tax Ford wouldn’t be as simple as picking up the phone and threatening the CEO with a huge import tax. Trump claimed the five Taliban leaders exchanged for Sgt. Bowe Bergdahl “are now back on the battlefield trying to kill us.” But all five remain in Qatar, where they continue to be monitored and are subject to a travel ban, according to the State Department. A department spokeswoman says none of them has returned to the battlefield. Trump argued that President Obama is a “bad negotiator” based on the deal the president approved to swap Bergdahl for five Taliban figures detained at Guantanamo Bay. Bergdahl, who was held captive by the Taliban for five years after wandering away from his base in Afghanistan, was charged on March 25 with desertion and misbehaving before the enemy. Trump, June 16: He [Obama] is the one that did Bergdahl. We get Bergdahl, they get five killer terrorists that everybody wanted over there. We get Bergdahl. We get a traitor. We get a no-good traitor, and they get the five people that they wanted for years, and those people are now back on the battlefield trying to kill us. That’s the negotiator we have. As part of the exchange, the five Taliban leaders were taken to Qatar, with the understanding that they would be monitored for a year and would be subject to a travel ban. That yearlong travel ban/monitoring was extended at the end of May, and no date was provided for when those restrictions might be lifted. State Department officials, however, have vehemently contested the claim that any of the men have rejoined the battlefield. Harf told us via email that nothing has changed in the two weeks since she made that statement. Trump made the misleading claim that health care premium “costs are going for people up 29, 39, 49 and even 55 percent.” He’s talking about proposed rate increases for 2016 for some plans on the individual market, but it’s unclear whether such increases will be approved by state insurance regulators. And other plans have proposed decreases in rates, or single-digit increases that didn’t have to be submitted for review. The Affordable Care Act requires insurers to submit any proposed rate increase above 10 percent for individual and small-group market plans to state and federal regulators for review. Insurers must publicly disclose the proposed increases and explain why they are necessary. These plans would be sold on the state and federal exchanges, as well as through insurance brokers for individuals buying their own plans. Most Americans get their insurance coverage through work, and their premiums have been rising at low rates for the past few years. But the individual market is different, and how premiums can be priced has changed under the ACA. Insurers must now accept anyone who wants insurance, and they can’t charge policyholders more based on health status. Plans also must cover certain minimum benefit standards. In early June, as the Associated Press explained, the federal government released the rate increase proposals for the individual market, and indeed, some of them are quite high. “Dozens of health insurers say higher-than-expected care costs and other expenses blindsided them this year, and they’re going to have to hike premiums for individual policies well-beyond 10 percent for 2016,” the AP reported, citing a 26 percent increase sought by Blue Cross and Blue Shield of North Carolina, and about 20 percent increases proposed by plans in Illinois, Florida and other states. Trump cites a 55 percent increase, and, in fact, there are plans that have requested increases that high, and even above. In New Mexico, one Blue Cross Blue Shield plan is proposing a 65 percent increase; the same plan decreased its premium rate by nearly 2 percent for 2015. Another New Mexico BCBS plan that dropped rates by 2.37 percent for 2015 is seeking a 58.75 percent increase for next year. This information is available on HealthCare.gov, where people can search for their specific health plan to see if their insurer has proposed an increase above 10 percent. Minnesota is another state in which some plans are requesting very high increases, above 50 percent. Other plans in the state have proposed increases around 20 percent or 10 percent. Some states, like New Mexico and Minnesota, also are experiencing more extreme proposals than others. In Ohio, for instance, only two of the 16 rate request increases exceed 20 percent. And, again, these proposals only include plans that are seeking increases above 10 percent. The Indianapolis Star published a story on June 15, showing that four of the nine insurance companies on the ACA exchange in Indiana are proposing to decrease premiums for 2016, some by double-digit percentages. Anthem of Indianapolis, which does the most business on the exchange for the state, has proposed a 3.8 percent rate increase. Individuals also can switch to lower-cost plans. As we wrote last year, the New York Times analyzed premium data for the exchanges for 2015 and found that many who stuck with the same plan could see increases, as high as 20 percent. But not if they shopped around. “In a typical county, the price will rise 5 percent for the cheapest silver plan and 4 percent for the second cheapest,” the Times wrote. Correction, June 17: In our original article we identified Peter Morici as a Fox News contributor. He is not a paid Fox News contributor. We also erred in saying Morici had overstated the U-6 measure. He did not. We failed to note that “immigration” was among the factors he was citing in addition to U-6. We regret these errors.